In further statements, Mr. Dawkins suggested that his view was rooted in the moral principle of reducing overall suffering whenever possible — in this case, that of individuals born with Down syndrome and their families. But Mr. Dawkins’s argument is flawed. Not because his moral reasoning is wrong, necessarily (that is a question for another day), but because his understanding of the facts is mistaken. Recent research indicates that individuals with Down syndrome can experience more happiness and potential for success than Mr. Dawkins seems to appreciate. Troyer knew there were many inspirational stories from families who have children or siblings with Down Syndrome and she recently compiled them in a new book, "It’s More Ups than Downs," published by Halo Publishing International (http://www.halopublishing.com). “After Ryan’s birth in 2001 a passion grew in me to reach out, love and share with new parents the wonderful blessings that come from having a child with Down Syndrome.” It’s More Ups than Downs includes stories from families with loved ones ranging in age from 9 months to 64 years old. More than two decades after Chris Burke, playing Corky Thatcher, first won the hearts of TV audiences in the Life Goes On series, another American with Down syndrome will soon grace the silver screen. Albuquerque's KOAT-TV reports that filming will soon begin for Everybody Loves Tim, a "docu-series" centered on Tim Harris who, since 2010, has welcomed customers to his popular breakfast-and-lunch joint in the "Duke City," called Tim's Place. The casting call is unique. Producers are looking for "people seeking to live a more confident and inspired life," and are interested in "learning how to live more like [Tim] does, with supreme confidence and the ability to live life to the fullest." The energetic, inspiring young restaurateur, and self-styled "hugging machine," has Down syndrome. The outlook for Tim and other Americans living with Down syndrome - as well as their families - has steadily been improving. Since their commonalities were first identified in the mid-19th century by Dr. John Langdon Down (1828-1896), we have come a long way in understanding and helping people with Down syndrome. Gone is the erroneous belief that the condition was somehow a parent's fault. Also gone, or nearly so, are hurtful and inaccurate descriptive terms. The advent of antibiotics, starting in the 1950s, has extended the life span of those with Down syndrome to around 60 years by eliminating the respiratory infections that usually ended their lives in childhood. When researchers at the University of California, San Diego wanted to study an experimental Alzheimer's drug last year, they sought help from an unlikely group: people with Down syndrome. "I had a CAT scan on my head, and I was in a special machine. It's called an MRI," says Justin McCowan, 39, whose parents drove him 125 miles from Santa Monica so he could participate in the study. McCowan also took brain function tests and spent hours with a needle in his arm so researchers could monitor levels of certain chemicals in his blood. Alzheimer's researchers are increasingly interested in people like McCowan because "people with Down syndrome represent the world's largest population of individuals predisposed to getting Alzheimer's disease," says Michael Rafii, director of the Memory Disorders Clinic at UCSD. Down syndrome is a genetic disorder that's best known for causing intellectual disability. But it also causes Alzheimer's. "By the age of 40, 100 percent of all individuals with Down syndrome have the pathology of Alzheimer's in their brain," Rafii says. Down syndrome is caused by the presence of an extra copy of chromosome 21. And one of the genes on chromosome 21 happens to control the production of amyloid, the substance that forms the sticky plaques associated with Alzheimer's. The first one is from 1999, when Irma was in her mid-50s. "You can see her signature is on the line, it's clear, she wrote it in script," Rafii says. By 2005, though, she has switched to large block letters. By 2009, Irma is misspelling her name. By 2011, "there are only a few characters written that resemble letters," Rafii says. "And in the very last year it's completely blank." And that has created a huge opportunity for Alzheimer's research, says William Mobley, chairman of the neuroscience department at UCSD. "This is the one group in the world that you could argue would benefit most by the institution of early therapy," he says. Early therapy means starting people on drug treatment years before the symptoms of Alzheimer's appear. The approach has been hard to test because, in the general population, there's no good way to know who is going to develop Alzheimer's. But for people with Down syndrome, it's a near certainty. Finding a drug that prevents Alzheimer's in people with Down syndrome could help millions of people who don't have the disorder, Mobley says. "This approach to treating Alzheimer's disease might apply to all of us," he says. "Imagine someday a drug that we all start taking when we're 25 so we never get Alzheimer's disease." That's a long-term goal. But already, people with Down syndrome are making a difference in Alzheimer's research. Early work with Down patients helped confirm the importance of amyloid. More recently, people with the disorder helped test an eye exam that may offer a simple way to screen for Alzheimer's. And then there's the study that Justin McCowan signed up for. It involves a drug from Transition Therapeutics called ELND005 that, in mice, can prevent the brain changes associated with Alzheimer's. Scientists hope the drug can do the same thing in people, including those with Down syndrome. McCowan says he volunteered for the study because he wants to help other people, especially a friend of his named Maria, who also has Down syndrome. "I feel very sad about Maria because she doesn't remember anything," McCowan says. His parents, Don and Annamarie McCowan, say their son's memory is still sharp. They hope that what scientists are learning from people like Justin will keep it that way. Hello! I am a mother of two school aged boys. We'll be at WDW this fall doing our crazy-paced tour of rides and coasters. I am considering booking another trip for late 2015 with the intention of taking my husband's sister, a 37 year old woman who has Down Syndrome. She is fairly independent (volunteers once a week at the library, etc), but is definitely very slow moving, slow to process, sometimes nervous and easily overwhelmed. She LOVES Disney--the shows and music and characters and princesses. I don't see her being able to handle many rides-- just ones like Peter Pan, Finding Nemo, Small World, etc. She has never been to WDW, as my MIL is not a fan of touristy things at all and they live near Vancouver (I'm east coast), so I would like to make this happen for her while we can. I think this kind of trip would necessitate leaving my kids at home with my husband, or, perhaps all of us going and then splitting up. I am wondering if anyone can offer advice or their experiences bringing adults with Down Sydrome to the Parks. It's a LOT of walking, and she is SLOW, a bit unsteady on her feet and overweight. She does ok walking the half mile to a bus stop, but I don't see her walking the park all day. Would you recommend special accomodations for someone with these particular limitations and abilities? I don't want her to be overwhelmed. Also, I'm so used to going from ride to ride, that I'm wondering if there's enough to do and see in the parks if we'd be skipping most rides. I've never taken care of her for days by myself, so it would be an adventure for both of us, but one I think I'm up to, especially because I know being there will light up her face. My 21 year old son has Down Syndrome. For us a wheelchair is a must. He cannot walk those kinds of distances at all. One time i had him leave the chair outside Space because it is too difficult to push up that ramp. As luck would have it, the moving walkway was out of service at the exit. By the time we got out, he was done for the day. Now I just make him walk the few inclines going in while I push the empty chair. We get some looks, but I don't care. It's the only way I can accommodate both of us. A scooter would be even better if she could operate it safely. I know my son couldn't. As far as attractions, there are some he doesn't like, but generally speaking his interests are about the same as a 10 year olds might be. He loves the characters and all of the shows, and many of the thrill rides. He won't get on ToT, EE, or Splash, and doesn't like RnR or BTMR. He does say he's outgrown IASWA. He LOVES Space, TT, Buzz Lightyear, TSMM, GMR, and MIssion Space. He loves Mickeys Philharmagic, the Indiana Jones show, and BATB. The cars stunt show is too loud for him. Studios is his favorite park, followed by MK, then Epcot. I pretty much have to drag him to AK, but he does love the Lion King show there. You don't say old your kids are, but I'm betting you could all enjoy the same basic list of attractions. I usually go alone with DS, but I would take another adult in a heartbeat when I can....pushing the wheelchair is getting to exhausting, especially as he gets heavier and I get older. thanks for all of your thoughts and replies. I do wonder about pushing a wheelchair myself all those days...We spend two weeks with her every summer when we visit, so I know her well, just never have been "in charge" of her, so to speak (as much as you can be in charge of anyone who is 37!). I do like the idea of a slower-paced trip, letting her decide what we should do, etc. I do hope I can make this happen--just still lots to think about and, luckily, lots of time to figure it all out. Brody Savicki is no stranger to the public eye. He's a local youngster with a lot of spirit. He also has Down Syndrome. Brody's Buddy Ride was created to raise money for local children with Down syndrome. Savicki has made many appearances on NewsChannel 2 Newstalk during the Live at Five Newshour. Saturday, some 75 bike riders set out on a 63-mile journey. The rode 63 miles because 63 is 21 times 3. It signifies Trisomy-21. The 21st chromosome has three copies in Down syndrome. The riders departed from Clinton and returned to Clinton at the end of their ride. Richard Majka coordinates the ride. He said, "All the money is donated to children and families who have children with Down syndrome, to help with any medical problems and any needs they have." deciding to either Donate or Dance! Be sure to use the hashtag #321DanceChallenge! Getting Down for Down Syndrome by Taking the #321DanceChallenge! Board Member Break Dances Bruce Bennett Does the Hustle! SANGER, TEXAS -- CNN -- They're not just water boys anymore. Two Texas teens are named honorary team captains of their football team. Football season is back in Sanger, Texas, and the only thing more sure than getting sacked and sweaty in practice is seeing these two young men on the sidelines. Blaky Pyron and Austin Waters are best friends, both going into their senior year at Sanger High. And for the past few years, the teenagers who live with Down Syndrome have been a big part of the varsity football team. Water boys who led the team out of the tunnel every single game. "These guys are special," said head coach Chuck Galbreath. "They have unique abilities and they live life to the fullest." Galbreath has gone out of his way to make these kids not just feel like they're a part of the team, but be a part of the team. "They're an inspiration for all of us, I know for me specifically," he said. The Australian government said Sunday it wants to help an impoverished surrogate mom who was left with a Down-syndrome son after the couple who paid her to have their children fled with his healthy twin sister. Pattaramon Chanbua, 21, gave birth to twins despite the couple’s plea to end the pregnancy over concerns about the boy’s health. He was also born with heart problems diagnosed during the pregnancy. Chanbua, a food vendor, has been since unable to afford medical bills for the 6-month-old boy. Abbott said it might be possible for the country to provide financial support for the boy and his mother. A Thai surrogate mother said Sunday that she was not angry with the Australian biological parents who left behind a baby boy born with Down syndrome, and hoped that the family would take care of the boy's twin sister they took with them. Pattaramon Chanbua, a 21-year-old food vendor in Thailand's seaside town of Sri Racha, has had to take a break from her job to take care of her 7-month-old surrogate baby, named "Gammy," who also has a congenital heart condition. The boy, with blond hair and dark brown eyes, is now being treated in a hospital for infection in his lungs. Pattaramon said she met the Australian couple once when the babies were born and knew only that they lived in Western Australia state. "I've never felt angry at them or hated them. I'm always willing to forgive them," Pattaramon told The Associated Press. "I want to see that they love the baby girl as much as my family loves Gammy. I want her to be well taken care of." An Australian couple left their Down syndrome baby with his Thai surrogate mother but took his twin sister. A Filipina teenager was given an opportunity to step inside the White House on Thursday (Friday in Manila) for a state dinner hosted by US President Barack Obama and wife Michelle for the participants for the Special Olympics Global Youth Activation Summit. 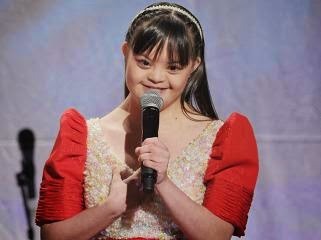 Brina Kei Maxino is the first Filipina to represent the Asia Pacific region at the summit and is the first teenager with Down Syndrome to have that distinction. The year-long summit would be in preparation for the 2015 Special Olympics World Summer Games to be held in Los Angeles, California. Not only Maxino was able to dine with the Obamas, she was also mentioned by the US president in his speech. "Today, in more than 170 countries, Special Olympians are athletes of all kinds — skiers and speed skaters, sailors, cyclists, equestrians and judo masters. They make extraordinary contributions to their communities. And I’m proud to highlight a few of them here tonight," Obama said.